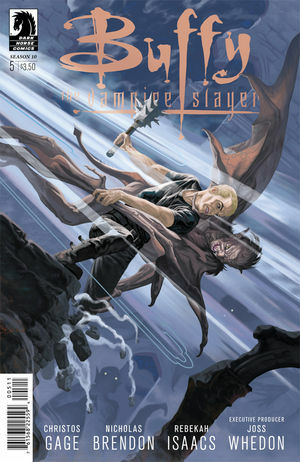 The “New Rules” storyline concludes in Buffy the Vampire Slayer Season 10 #5, out tomorrow, quite satisfactorily. Writer Christos Gage has managed to lay out clearly for readers the idea that things will be different, now that magic is back but in as-yet-undefined changed fashion. Yet he focuses first on the story, not the message — the main Scooby gang, all together here once again, and enjoyably so, are still fighting to save the world. I’m impressed by the way Gage has a new threat each issue, yet it’s all built upon the previous installments of the storyline. Here, as suits the climatic issue, it’s a big ol’ monster. Speaking of the team, Buffy is more confident of herself as a leader, which means she delegates more and allows others more focus because she has less to prove. The teen Giles is a terrific change that plays into and is a constant reminder of the fantastic universe setting. Willow has her magic back, with a good amount of power tempered by uncertainty over what will actually happen. Xander and Dawn are contributing while struggling with their relationship; the return of magic has affected Dawn in an unexpected but surprisingly logical way. Best of all, Spike is still around. Gage does an amazing job capturing everyone’s voices and conveying an awful lot of story while still providing the wisecracks and humor and characterization we expect from this beloved property. It’s a wonderful way of capturing the appeal of the show, now that it’s impossible to do the same anywhere but in comics. (I wish the other franchise book had as talented a writer on it.) I also like how he calls back to previous plot elements and series without being exclusionary to those who have only begun reading recently. Since Nicholas Brendon (who played Xander on the show) began co-writing with this arc, one shouldn’t be surprised that Xander gets some significant character development here. It’s fully in keeping with the character’s history, though, and others don’t get short shrift because of it. As the “everyman” character, it’s easy to overlook his contributions, and it’s good to see him get attention without maiming or torturing the character (part of the final TV run I disliked). The universe is so rich that I’m also glad to see more supporting cast members get a bit of focus, including here Andrew and (surprise!) Anya. There’s a lot more story there that I hope to see in future. I’ve given no attention yet to the art, which is equally talented and accomplished. The biggest problem with licensed work is likenesses that resemble the actor so closely the art becomes stiff and photo-referenced. That isn’t the case here. Everyone looks the way they should, but the characters are full of emotion, expression, and motion. Rebekah Isaacs also does a great job with scale, when it comes to giant monsters and fighting battles.